We worked alongside Ilchester Community Primary School to create a dream Multi Use Games Area for the school and local community to enjoy in all seasons. The school originally had an unattractive grass surface that offered limited physical play opportunities and would get affected by the famed English weather. The children needed something special to spark and promote an active and healthy lifestyle as well as equipment that would promote sport practise and group competition. The children can now practise and enjoy sports including football, netball and hockey. Ilchester's new MUGA will also benefit the lives of the teachers and the overall education of the children as they will be begin to approach school more positively which will in turn, enhance their attitude within the classroom. With a brighter outlook and healthier lifestyle, the children's results and assessments will also begin to improve. Children will feel extremely lucky, proud and excited to have and use this exciting new play resource and as a result, their work rate will increase and their overall physical activity and enjoyment of P.E and specific sports activities. Confidence within the children will be boosted, as the Fencing will make the MUGA feel enclosed and separated to the rest of the school, helping certain children to express themselves more freely. The MUGA includes floodlights which means sports clubs can use the facilities after school during winter seasons. 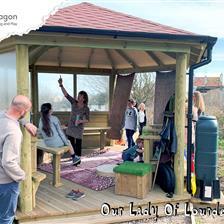 With the addition of the Timber Canopy, bags and resources can be kept dry in worse weathers, as well as being a fantastic place to talk classes through lesson and game plans before they enter the pitch. It also seconds as a covered area where parents can sit to watch their children taking part in sports events and activities. To get a better feel of what we have created for Ilchester Community Primary School, take a look at the video showing a first person view of the MUGA; get a feel of the excitement children will feel taking part in numerous activities with classmates for many years to come! 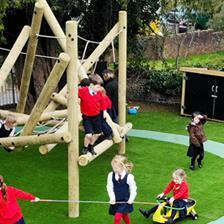 Have you got an outdoor environment that needs developing? 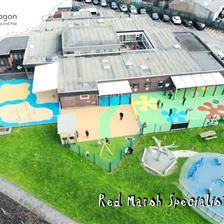 Then look no further, we have helped thousands of schools across the country to create their ideal outdoor space to fit their specific curriculum demands. Give us a call on 01625 890 330 (North Office), 0117 379 0899 (Southern Office) or Contact Us through our website to speak to one of our specialist consultants. Learn more about Pentagon and our innovative School Playground Equipment that has transformed over 6000 playground settings.